This manual provides reference documentation to SfePy from a user’s perspective. The following should be run in the top-level directory of the SfePy source tree after compiling the C extension files. See Installation for full installation instructions info. The $ indicates the command prompt of your terminal. Simple wrapper for main SfePy commands. This is a “new” supported method. Any SfePy script can be still run as stand-alone (as mentioned above). Both “inplace” and “system-wide” installations are supported. # Test if linear elasticity input file works. -c "key : value, ...", --conf="key : value, ..."
-O "key : value, ...", --options="key : value, ..."
-d "key : value, ...", --define="key : value, ..."
Warning: This feature is preliminary and does not support terms with internal state. and break the computation after a while (hit Ctrl-C). The mode --save-restart=-1 is currently the only supported mode. It saves a restart file for each time step, and only the last computed time step restart file is kept. A file named 'unit_ball.restart-? ?.h5' should be created, where '??' indicates the last stored time step. Let us assume it is 'unit_ball.restart-04.h5', i.e. the fifth step. and compare the residuals printed in the corresponding time steps. resulting data files are present. displacements which leads to invisible glyph size. $ python postproc.py output-tests/test_hyperelastic. *.vtk                          --ranges=u,0,0.02 -a mov --ffmpeg-options="-r 2 -sameq"
Here we discuss the basic items that users have to specify in their input files. For complete examples, see the problem description files in the examples/ directory of SfePy. Besides the short syntax described below there is (due to history) also a long syntax which is explained in Problem Description File - Long Syntax. The short and long syntax can be mixed together in one description file. The VTK and HDF5 formats can be used for storing the results. The format can be selected in options, see Miscellaneous. Regions serve to select a certain part of the computational domain using topological entities of the FE mesh. They are used to define the boundary conditions, the domains of terms and materials etc. If D = 2, faces are not defined and facets are edges. 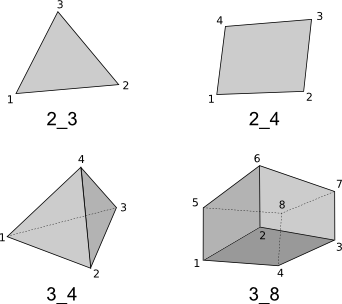 If D = 3, facets are faces. cell, facet, face, edge, vertex - entities of higher dimension are not included. cell_only, facet_only, face_only, edge_only, vertex_only - only the specified entities are included, other entities are empty sets, so that set-like operators still work, see below. The cell kind is the most general and should be used with volume terms. It is also the default if the kind is not specified in region definition. The facet kind (same as edge in 2D and face in 3D) is to be used with boundary (surface integral) terms. The vertex (same as vertex_only) kind can be used with point-wise defined terms (e.g. point loads). The kinds allow a clear distinction between regions of different purpose (volume integration domains, surface domains, etc.) and could be uses to lower memory usage. A region definition involves topological entity selections combined with set-like operators . The set-like operators can result in intermediate regions that have the cell kind. The desired kind is set to the final region, removing unneeded entities. Most entity selectors are defined in terms of vertices and cells - the other entities are computed as needed. Only if mesh format supports reading boundary condition vertices as vertex sets. <expr> is a logical expression like (y <= 0.1) & (x < 0.2). In 2D use x, y, in 3D use x, y and z. & stands for logical and, | stands for logical or. <function> is a function with signature fun(coors, domain=None), where coors are coordinates of mesh vertices. <efunction> is a function with signature fun(coors, domain=None), where coors are coordinates of mesh cell centroids. Optional bubble function enrichment is marked by ‘B’. The essential boundary conditions set values of DOFs in some regions, while the constraints constrain or transform values of DOFs in some regions. The Dirichlet, or essential, boundary conditions apply in a given region given by its name, and, optionally, in selected times. The times can be given either using a list of tuples (t0, t1) making the condition active for t0 <= t < t1 , or by a name of a function taking the time argument and returning True or False depending on whether the condition is active at the given time or not. The periodic boundary conditions tie DOFs of a single variable in two regions that have matching nodes. Can be used with functions in sfepy.discrete.fem.periodic. The linear combination boundary conditions (LCBCs) are more general than the Dirichlet BCs or periodic BCs. They can be used to substitute one set of DOFs in a region by another set of DOFs, possibly in another region and of another variable. The LCBCs can be used only in FEM with nodal (Lagrange) basis. 'shifted_periodic' - generalized periodic BCs that work with two different variables and can have a non-zero mutual shift. Only the 'shifted_periodic' LCBC needs the second region and the DOF mapping function, see below. Materials are used to define constitutive parameters (e.g. stiffness, permeability, or viscosity), and other non-field arguments of terms (e.g. known traction or volume forces). Depending on a particular term, the parameters can be constants, functions defined over FE mesh nodes, functions defined in the elements, etc. 'm3' : (None, 'get_pars'), # Same as the above line. Equations can be built by combining terms listed in Term Table. 'Temperature' : """dw_laplace.a.Omega( coef.val, s, t ) = 0"""
In SfePy, a non-linear solver has to be specified even when solving a linear problem. The linear problem is/should be then solved in one iteration of the nonlinear solver. Another possibility is to use a “virtual” solver that ensures an automatic selection of an available solver, see Virtual Linear Solvers with Automatic Selection. Functions are a way of customizing SfePy behavior. They make it possible to define material properties, boundary conditions, parametric sweeps, and other items in an arbitrary manner. Functions are normal Python functions declared in the Problem Definition file, so they can invoke the full power of Python. In order for SfePy to make use of the functions, they must be declared using the function keyword. See the examples below. The functions for defining material parameters can work in two modes, distinguished by the mode argument. The two modes are ‘qp’ and ‘special’. The first mode is used for usual functions that define parameters in quadrature points (hence ‘qp’), while the second one can be used for special values like various flags. The shape and type of data returned in the ‘special’ mode can be arbitrary (depending on the term used). On the other hand, in the ‘qp’ mode all the data have to be numpy float64 arrays with shape (n_coor, n_row, n_col) , where n_coor is the number of quadrature points given by the coors argument, n_coor = coors.shape , and (n_row, n_col) is the shape of a material parameter in each quadrature point. For example, for scalar parameters, the shape is (n_coor, 1, 1) . See examples/diffusion/poisson_functions.py for a complete problem description file demonstrating how to use different kinds of functions. Note that when setting more than one component as in get_ebc_all() above, the function should return either an array of shape (coors.shape, n_components) , or the same array flattened to 1D row-by-row (i.e. node-by-node), where n_components corresponds to the number of components in the boundary condition definition. For example, with ‘u. [0, 1]’ , n_components is 2. # Just another way of adding a function, besides 'functions' keyword. The options can be used to select solvers, output file format, output directory, to register functions to be called at various phases of the solution (the hooks ), and for other settings. # step restart file is kept. post_process_hook enables computing derived quantities, like stress or strain, from the primary unknown variables. See the examples in examples/large_deformation/ directory. parametric_hook makes it possible to run parametric studies by modifying the problem description programmatically. See examples/diffusion/poisson_parametric_study.py for an example. where , for . The integrals over the discrete domain are approximated by a numerical quadrature, that is named in our case. where <i> denotes an integral name (i.e. a name of numerical quadrature to use) and <r> marks a region (domain of the integral). In the following, <virtual> corresponds to a test function, <state> to a unknown function and <parameter> to a known function arguments. When solving, the individual terms in equations are evaluated in the ‘weak’ mode. The evaluation modes are described in the next section. explicitly using Problem.evaluate(). This way is mostly used in the postprocessing. ‘weak’ : Assemble (in the finite element sense) either the vector or matrix depending on diff_var argument (the name of variable to differentiate with respect to) of Term.evaluate(). This mode is usually used implicitly when building the linear system corresponding to given equations. ‘eval’ : The evaluation mode integrates the term (= integral) over a region. The result has the same dimension as the quantity being integrated. This mode can be used, for example, to compute some global quantities during postprocessing such as fluxes or total values of extensive quantities (mass, volume, energy, …). ‘el_eval’ : The element evaluation mode results in an array of a quantity integrated over each element of a region. ‘el_avg’ : The element average mode results in an array of a quantity averaged in each element of a region. This is the mode for postprocessing. ‘qp’ : The quadrature points mode results in an array of a quantity interpolated into quadrature points of each element in a region. This mode is used when further point-wise calculations with the result are needed. The same element type and number of quadrature points in each element are assumed. Note that the naming prefixes are due to history when the mode argument to Problem.evaluate() and Term.evaluate() was not available. Now they are often redundant, but are kept around to indicate the evaluation purpose of each term. Several examples of using the Problem.evaluate() function are shown below. A solution to equations given in a problem description file is given by the variables of the ‘unknown field’ kind, that are set in the solution procedure. By default, those are the only values that are stored into a results file. The solution postprocessing allows computing additional, derived, quantities, based on the primary variables values, as well as any other quantities to be stored in the results. This will be called after the problem is solved. # Cauchy strain averaged in elements. # Cauchy stress averaged in elements. The full example is linear_elasticity-linear_elastic_probes. The full example is biot-biot_npbc. The full example is linear_elasticity/material_nonlinearity.py. VTK probes: It is the simple way of probing using the ‘post_process_hook’ . It generates matplotlib figures with the probing results and previews of the mesh with the probe paths. See Primer or linear_elasticity-its2D_5 example. SfePy probes: As mentioned in Miscellaneous, it relies on defining two additional functions, namely the ‘gen_probes’ function, that should create the required probes (see sfepy.discrete.probes), and the ‘probe_hook’ function that performs the actual probing of the results for each of the probes. This function can return the probing results, as well as a handle to a corresponding matplotlib figure. See linear_elasticity/its2D_4.py for additional explanation. Using sfepy.discrete.probes allows correct probing of fields with the approximation order greater than one, see Interactive Example in Primer or linear_elasticity/its2D_interactive.py for an example of interactive use. This section describes the time-stepping, nonlinear, linear, eigenvalue and optimization solvers available in SfePy. There are many internal and external solvers in the sfepy.solvers package that can be called using a uniform interface. All PDEs that can be described in a problem description file are solved internally by a time-stepping solver. This holds even for stationary problems, where the default single-step solver ('ts.stationary') is created automatically. In this way, all problems are treated in a uniform way. The same holds when building a problem interactively, or when writing a script, whenever the Problem.solve() function is used for a problem solution. ts.adaptive: Implicit time stepping solver with an adaptive time step. ts.bathe: Solve elastodynamics problems by the Bathe method. ts.generalized_alpha: Solve elastodynamics problems by the generalized method. ts.newmark: Solve elastodynamics problems by the Newmark method. ts.simple: Implicit time stepping solver with a fixed time step. ts.stationary: Solver for stationary problems without time stepping. ts.velocity_verlet: Solve elastodynamics problems by the velocity-Verlet method. See sfepy.solvers.ts_solvers for available time-stepping solvers and their options. Almost every problem, even linear, is solved in SfePy using a nonlinear solver that calls a linear solver in each iteration. This approach unifies treatment of linear and non-linear problems, and simplifies application of Dirichlet (essential) boundary conditions, as the linear system computes not a solution, but a solution increment, i.e., it always has zero boundary conditions. nls.newton: Solves a nonlinear system using the Newton method. nls.oseen: The Oseen solver for Navier-Stokes equations. nls.petsc: Interface to PETSc SNES (Scalable Nonlinear Equations Solvers). nls.scipy_broyden_like: Interface to Broyden and Anderson solvers from scipy.optimize. nls.semismooth_newton: The semi-smooth Newton method. See sfepy.solvers.nls, sfepy.solvers.oseen and sfepy.solvers.semismooth_newton for all available nonlinear solvers and their options. Choosing a suitable linear solver is key to solving efficiently stationary as well as transient PDEs. SfePy allows using a number of external solvers with a unified interface. ls.mumps: Interface to MUMPS solver. ls.mumps_par: Interface to MUMPS parallel solver. ls.petsc: PETSc Krylov subspace solver. ls.pyamg: Interface to PyAMG solvers. ls.pyamg_krylov: Interface to PyAMG Krylov solvers. ls.schur_mumps: Mumps Schur complement solver. ls.scipy_direct: Direct sparse solver from SciPy. ls.scipy_iterative: Interface to SciPy iterative solvers. ls.scipy_superlu: SuperLU - direct sparse solver from SciPy. ls.scipy_umfpack: UMFPACK - direct sparse solver from SciPy. See sfepy.solvers.ls for all available linear solvers and their options. A “virtual” solver can be used in case it is not clear which external linear solvers are available. Each “virtual” solver selects the first available solver from a pre-defined list. ls.auto_direct: The automatically selected linear direct solver. ls.auto_iterative: The automatically selected linear iterative solver. See sfepy.solvers.auto_fallback for all available virtual solvers. eig.pysparse: Pysparse-based eigenvalue solver for sparse symmetric problems. eig.scipy: SciPy-based solver for both dense and sparse problems. eig.scipy_lobpcg: SciPy-based LOBPCG solver for sparse symmetric problems. eig.sgscipy: SciPy-based solver for dense symmetric problems. See sfepy.solvers.eigen for available eigenvalue problem solvers and their options. eig.qevp: Quadratic eigenvalue problem solver based on the problem linearization. See sfepy.solvers.qeigen for available quadratic eigenvalue problem solvers and their options. nls.scipy_fmin_like: Interface to SciPy optimization solvers scipy.optimize.fmin_*. opt.fmin_sd: Steepest descent optimization solver. See sfepy.solvers.optimize for available optimization solvers and their options. The PETSc-based nonlinear equations solver 'nls.petsc' and linear system solver 'ls.petsc' can be used for parallel computations, together with the modules in sfepy.parallel package. This feature is very preliminary, and can be used only with the commands for interactive use - problem description files are not supported (yet). The key module is sfepy.parallel.parallel that takes care of the domain and field DOFs distribution among parallel tasks, as well as parallel assembling to PETSc vectors and matrices. The partitioning of the domain and fields DOFs is not done in parallel and all tasks need to load the whole mesh and define the global fields - those must fit into memory available to each task. While all KSP and SNES solver are supported, in principle, most of their options have to be passed using the command-line parameters of PETSc - they are not supported yet in the SfePy solver parameters. There are no performance statistics yet. The code was tested on a single multi-cpu machine only. The global solution is gathered to task 0 and saved to disk serially. The vertices of surface region selector does not work in parallel, because the region definition is applied to a task-local domain. See their help messages for further information. 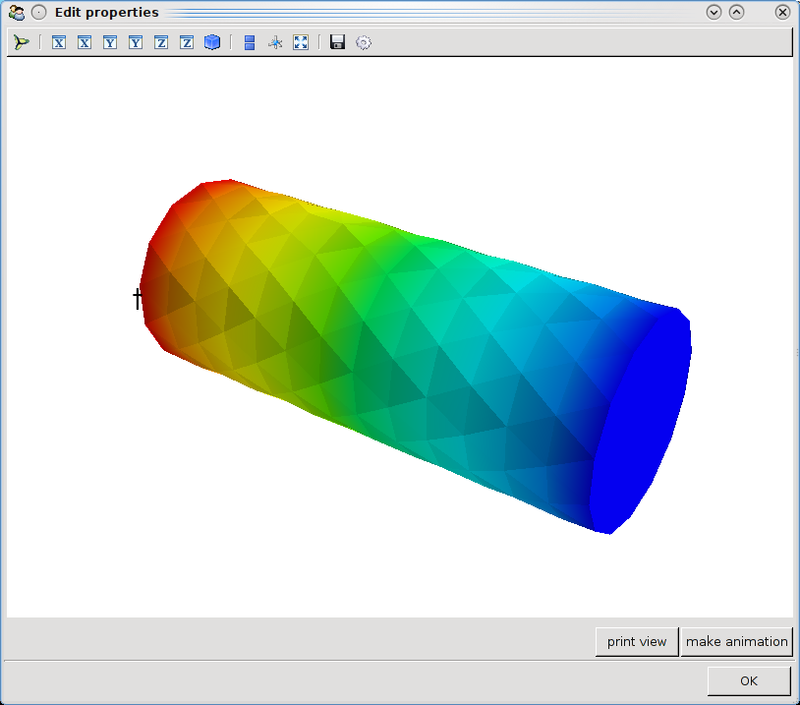 Isogeometric analysis (IGA) is a recently developed computational approach that allows using the NURBS-based domain description from CAD design tools also for approximation purposes similar to the finite element method. The implementation is SfePy is based on Bezier extraction of NURBS as developed in . This approach allows reusing the existing finite element assembling routines, as still the evaluation of weak forms occurs locally in “elements” and the local contributions are then assembled to the global system. The IGA code is still very preliminary and some crucial components are missing. The current implementation is also very slow, as it is in pure Python. NURBS patch data (knots, degrees, control points and weights). Those can either be generated using igakit, created manually or imported from other tools. Bezier extraction operators and corresponding DOF connectivity (computed by SfePy). Bezier mesh control points, weights and connectivity (computed by SfePy). The Bezier mesh is used to create a topological Bezier mesh - a subset of the Bezier mesh containing the Bezier element corner vertices only. Those vertices are interpolatory (are on the exact geometry) and so can be used for region selections. The domain description files contain vertex sets for regions corresponding to the patch sides, named 'xiIJ', where I is the parametric axis (0, 1, or 2) and J is 0 or 1 for the beginning and end of the axis knot span. Other regions can be defined in the usual way, using the topological Bezier mesh entities. There is filename_domain instead of filename_mesh. The approximation order in the first definition is None as it is given by the NURBS degrees in the domain description. The second definition is equivalent to the first one. The third definition, where %d should be a non-negative integer, illustrates how to increase the field’s NURBS degrees (while keeping the continuity) w.r.t. the domain NURBS description. It is applied in the navier_stokes/navier_stokes2d_iga.py example to the velocity field. Michael J. Borden, Michael A. Scott, John A. Evans, Thomas J. R. Hughes: Isogeometric finite element data structures based on Bezier extraction of NURBS, Institute for Computational Engineering and Sciences, The University of Texas at Austin, Austin, Texas, March 2010.